Tourists, vacationers, IT professionals, pensioners, nature lovers and religious pilgrims regularly make their way to Bangalore, the capital city of the state of Karnataka in South India. Bangalore is an old city, dating back to 1537, but is now the most highly industrialized metropolis and third most densely populated city in India. Millions of local and international travelers come here for a number of reasons, since the city offers so many sights, attractions and religious places and events. 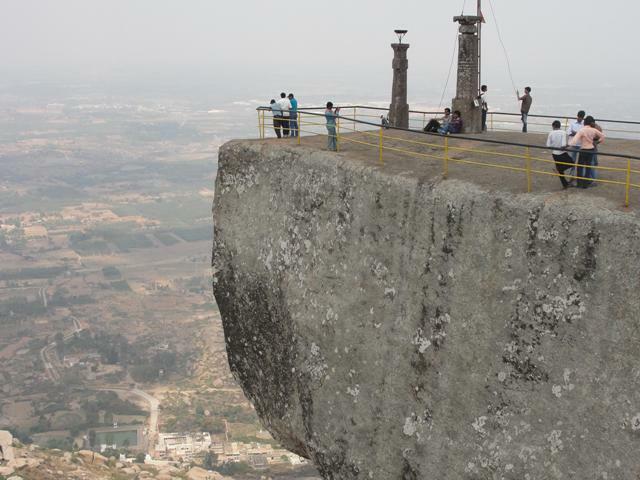 Shivaganga attracts both nature lovers and religious pilgrims, since it is primarily a steep hill with a number of temples with a view. There are two temples dedicated to the Lord Shiva; one is found at the bottom of the hill, while the other is on top, which means the two are 5-km uphill apart. They are dedicated to the worship of Lord Shiva, and it would seem that this Hindu deity bears great importance here since the name of the hill comes from the words “Shiva” and “Ganga”, pertaining to the Ganges River. It is believed that the water that is found on top of the hill is as holy as that in Ganges. Also found here are old temples, which include the Dakshin Kashi and Varanasi temples. The view from on top is stunning. As devotees pray to Shiva in the temples, get a glimpse of the natural beauty around you. Enjoy a breathtaking view of the nearby pond and the surrounding city. You can see Bangalore as it is only 50 km away, while Tumkur is 20 km away. Climb higher to get the best view, but make sure to hold on to the railings since the area is very rocky. Expect to be pestered by resident monkeys as they try to steal food or seemingly valuable items from you at any given opportunity. There are plenty of trekking opportunities as you enjoy visiting the fountains, bodies of water, and a tunnel that folk people say leads all the way to Bangalore. When in Bangalore, other tourist attractions to check out are the Bull Temple, ISKCON Temple, Bangalore Palace, Ulsoor Lake, Cubbon Park, Nandi Hills and Sultan Tipu’s Summer Place. There are also a number of open markets, local shops and modern department stores for shoppers. To get to Shivaganga, take the National Highway 4, which connects Bangalore and Tumkur. The trip makes for a perfect day tour. You can leave early in the morning, and return to the city just before sunset. The climb up the hill is about 2 hours and a half for the average climber, while the climb down may take about 2 hours, as well. It is best to avoid visiting on a Sunday since the place could be overcrowded with worshippers and tourists.